The Neotropical Region or Neotropics, contains vast expanses of rain forest and river systems representing some of the most biologically diverse ecosystems on Earth, but much of its resident biota remains undescribed and undocumented, and some of it is at risk of extirpation and extinction. Anthropogenic disturbances, especially deforestation, urbanization, and climate change, threaten the integrity of the Neotropics and its biodiversity. In the Neotropics, freshwater habitats are particularly susceptible to environmental stressors and freshwater species throughout the Neotropics have experienced marked declines greater than those of other groups when compared to marine and terrestrial systems. Advances in taxonomic descriptions, preparation of keys, and faunal assessments will aid future studies as well as conservation efforts. This article is published as Bowles, David E., and Gregory W. Courtney. 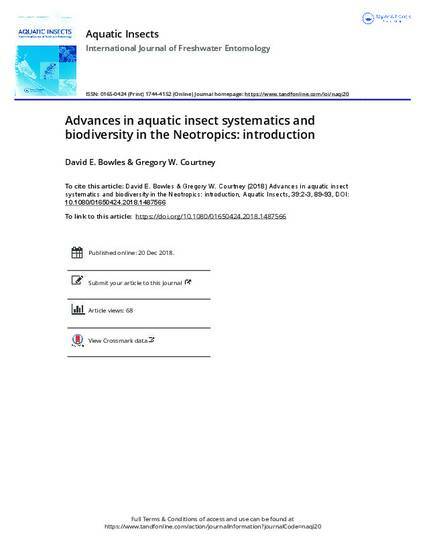 "Advances in aquatic insect systematics and biodiversity in the Neotropics: introduction." 39 (2018): 89-93. doi: 10.1080/01650424.2018.1487566.